Oh, Peter King. This is a rough tweet. It reads like a supremely off-color Henny Youngman joke. 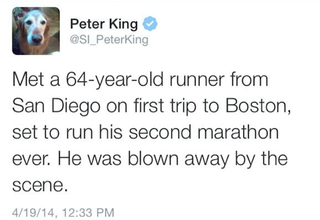 The tweet—which was obviously an unintentionally poor choice of words has since been deleted—is quite possibly the worst choice of words to describe a runner's impression of the scene days before running the Boston Marathon for the first time. King later acknowledged his error, thanking readers for pointing it out, and tried again.